Shirts With Random Triangles: Dabo Swinney Sleds Down Clemson Stadium's Memorial Hill. 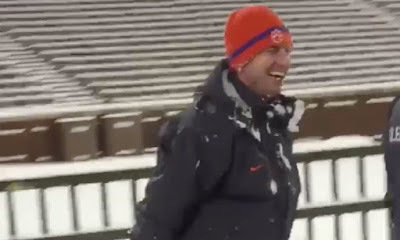 Dabo Swinney Sleds Down Clemson Stadium's Memorial Hill. Dabo Swinney. Image via For the Win. You can either whine about the Winter Storm Jonas, or can enjoy it. The Clemson football team decided to do latter as it had fun in Snow-covered Clemson Memorial Stadium on Friday night. 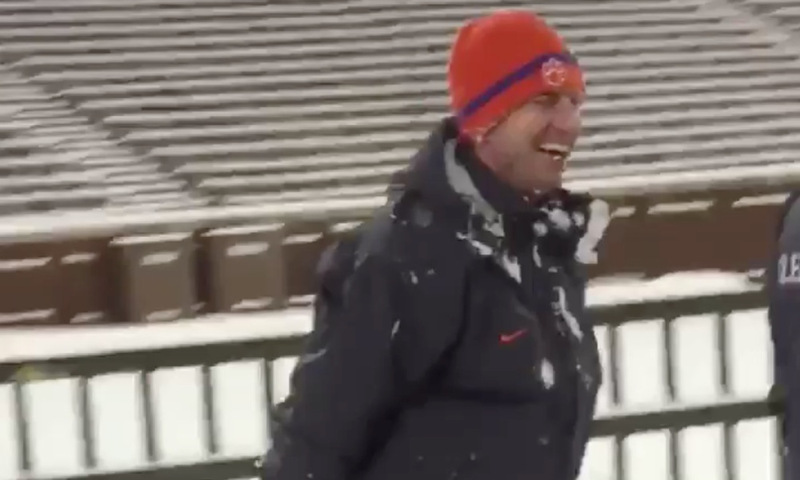 Clemson head coach Dabo Swinney partook in the fun as well, sledding down Death Valley's sacred Memorial Hill. Tigers co-offensive coordinator and wide receivers coach Jeff Scott recorded the event for posterity. ESPN reports that Swinney didn't touch Howard's Rock before he went down Memorial Hill. Seems a shame that he didn't.